I am absolutely convinced that the brand Thai Kitchen was made solely to keep Thai restaurants in business. Their products taste awful, yet every grocery store in America seems to carry them. With the right ingredients, you can make your favorite Thai curries at home for less money and time than any restaurant. To make a great coconut curry, you will need to start with the right coconut milk. Buy one that naturally separates, and doesn’t contain any sweeteners. I recommend Chaokoh Brand Coconut Milk as it gives the dish a mellow, rich flavor. Do not shake your cans of coconut milk, as you want the oil and liquids to separate so you can use the fat as cooking oil. I have tried about half a dozen Thai Curry Pastes, and the only brand I recommend is Mae Ploy. Adjust your recipe to use less fish sauce if you are using Mae Ploy, as the shrimp paste can make dishes overwhelmingly salty. Mae Ploy Pastes have a great flavor profile and can be adjusted to any spice tolerance. 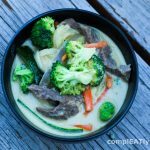 If you’re looking for a dish that stores will, coconut green curry is a great choice. You can add this to your list of dishes on Meal-Prep Sunday for a delicious meal to eat later in the week. *Some of the links in this article are affiliate links, meaning at no additional cost to you, I will earn a commission if you click through and make a purchase. Chop the onion, bell pepper, zucchini, and carrots into 3 inch match sticks. Slice the beef into thin stir fry strips. Heat a large wok, over medium high. Scoop 1 tablespoon of the coconut solid into the hot pan (use vegetable/peanut oil, if the coconut milk has not separated). Add the curry paste to the pan, and stir until the mixture of coconut solid and paste has thickened (warning: do this in a well ventilated kitchen. I usually gauge the readiness of the paste, by how much I am coughing/crying). Add the meat, and 1/2 of the can of coconut milk. stir together to coat the meat. continue stirring and simmering for about 1 minute before adding in the onion. Continue stirring in the onion until the sauce has thickened, and the meat is well coated. Add the rest of the coconut milk, along with the bell pepper, zucchini, and carrots. Stir the ingredients together, and then cover for 3 minutes. Add the broccoli, and cook for 1 more minute. Add fish sauce just before serving (be sure to taste first).